The amber ale produced by Stanley Park Brewery is a product that has seamlessly assimilated itself into the Vancouver craft beer and pub scene.Widely available and boasting its local connection back to the late 1800’s, it’s a company that is very aware of it’s carbon footprint and has sought new ways to scale back their energy consumption – with more efficient machinery and a wind powered turbine. While energy efficiency is not something picked out in the beer’s qualitative features, it does make a person feel better to drink green, and no “green beer” on St. Patrick’s Day doesn’t count! This particular Belgian style amber is unpasteurized and even the ink on the labels is non-toxic as it derives from vegetables… but this is a beer blog, and as such this beer is pretty solid. This beer is one that I find appealing for two reasons: the ideals of sustainability, and the easy drinking taste and body of this brew. Available from six-packs, to pub pints, and at football and soccer games at BC Place, this beer is widely available compared to a few years ago. The nose is a slight malt, with no typically noticeable Belgian traits, and no sense of hops – floral or otherwise- in the scent.Very straight forward, very approachable. The body is light, crisp, with a slight bitterness on initial sip that tingles the tongue. It’s taste was more malty than hoppy, without elements I’d say are typical of a true Belgian style beer. Simplicity is not a fault however, as it makes this beer an easy beverage to enjoy. The finish is a brief malt on the palate, but is otherwise very tame. Having tried it in pints, bottles and plastic cups at sporting events, I think bottle is the best way to have this beer. On a hot summers night with good company a person could easily finish off a six-pack without really noticing it. Next time you go to a sporting event in this city (Vancouver), be sure to try this instead of a Bud or Molson. Back again is the Innis & Gunn Canada Day, a special oak aged seasonal. Several differences have been made since the 2011 edition. Still using ex-bourbon barrels, the 2012 is aged for 49 days rather than 54, utilizes Goldings hops rather than Fuggles, and boasts a 7.7% rather than 8.3. Of course, these elements may seem like minor differences, but based on the marked change in overall taste, they are certainly not worth overlooking. We did a vertical, concomitant tasting of both editions — 2011 and 2012 — and this review will hold some notes about the 2011 edition as well. Tristan and I came to a consensus that the Innis & Gunn 2011 got better with age, and both of us scored it higher this time around. After noticing a pleasant dichotomy between the two beers, sipping one after the other, we decided to mix some of it together. The result was great, and certainly worth trying if you happen to have a bottle of each. First off, I was highly disappointed with the 2012 release. While the Canada Day is up there with my favourite beers, the 2012 is not nearly as enjoyable. The malt overtones denounce the flavours of the original; it barely even tastes like an Innis & Gunn beer. On the nose, the malt overpowers and subdues any trace amounts of oak-infused toffee, caramel, vanilla, or butterscotch — all of which are present in the 2011. The body is silky rather than creamy like the other Innis & Gunn beers, and, instead of the sweet, savoury notes on the palate, are notes of tropical fruit, citrus, a bit of hops, and a lot of malt. Initially, the beer is quite spicy, with notes of peppers, cumin, and nutmeg. This weirdly dissipates rather quickly — Tristan, tasting it a mere few minutes later, missed out on it completely. There is a lingering malt sweetness, but a relatively crisp finish, where the Goldings hops finally come through. This quickly became my least favourite Innis & Gunn beer, and, though I will probably buy a couple more — one to drink and one to age — I’d rather spend my money on the original. Both Tristan and I found the 2011 edition to have gotten better with age. After a year, the character changed quite drastically. It’s no longer citrusy or hoppy, and lends more of a Belgian flavour. I believe that, after a year, the beer may have gone through a spontaneous re-fermentation. There is coagulated yeast floating in the bottle and it is somewhat heavier than it was before. Both of us enjoyed it. I gave it a rating of 90 pts, 3 marks higher than previously. The 2011 Canada Day release wasn’t earth shaking in my books, so I was feeling rather reserved going into this tasting. Frankly I am surprised by this release and how underwhelming it was. 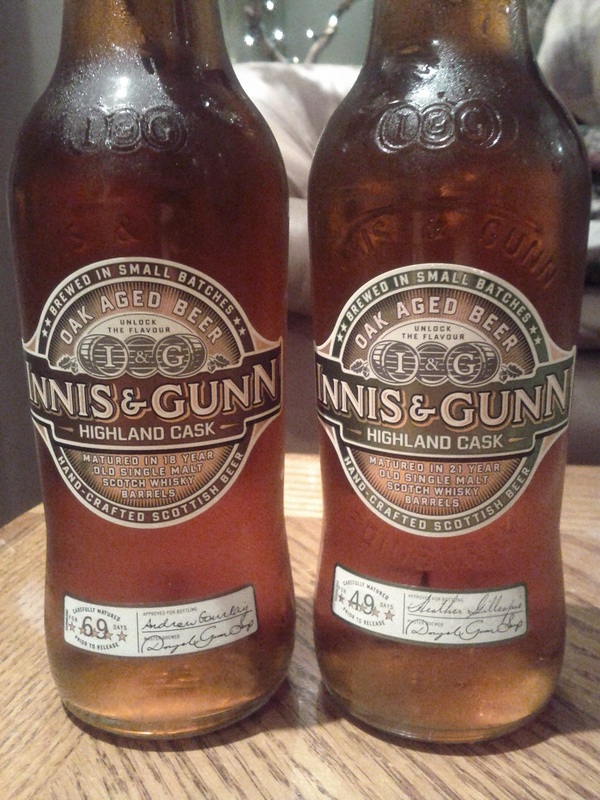 Yes, it was bound to happen… …Innis & Gunn released a beer that neither Kamran or I fell in love with. It was a strange mix of sweet and a lack of complexity that I picked up on. While the recipe was very different, I felt that this was a step backwards. The nose was malt heavy and a little overpowering. The hops were very faint under it all with the oak and toffee. The body was velvety, medium thickness, slightly bitter. The taste had hints of spice that Kamran more successfully tasted and identified. It lacked a wow factor, with no oak taste. The finish was malty sweet, some light fruit and vanilla with the hops only on the very end of the finish. Contrast that with the aged 2011 Canada Day and there is a big difference. The aging process to the 2011 release was very kind in its final result, becoming a more balanced and even keeled beer. the nose was tamed and fairly mono, the body felt thicker and less bitter. The taste was mild, fruity, floral and genuinely quite pleasant. Finally the finish was flat due too a lack of carbonation, but a solid minute of flavour after swallowing. The final mark increased by 1.5 pts to a total of 82 pts. when aged. Overall, if you purchased or plan to purchase what’s left of the 2012 stock, consider aging it for a year and it should improve. But honestly this is one I would pass up. This beer was one that was looked forward to by us. The Innis & Gunn Irish Cask Stout was released in early 2012 for St. Patrick’s Day. Aged for 60 days in barrels that housed a triple distilled Irish whiskey, this beer boasts a full flavored and complex taste to enjoy any time of the year, not just March 17th! Heavier and darker than all other Innis & Gunn beers, the stout shares the unique Innis & Gunn quality of smooth, low carbonated, oak-imbued richness. While the stout flavours are somewhat dampered by the oak, they are at the forefront of the beer. 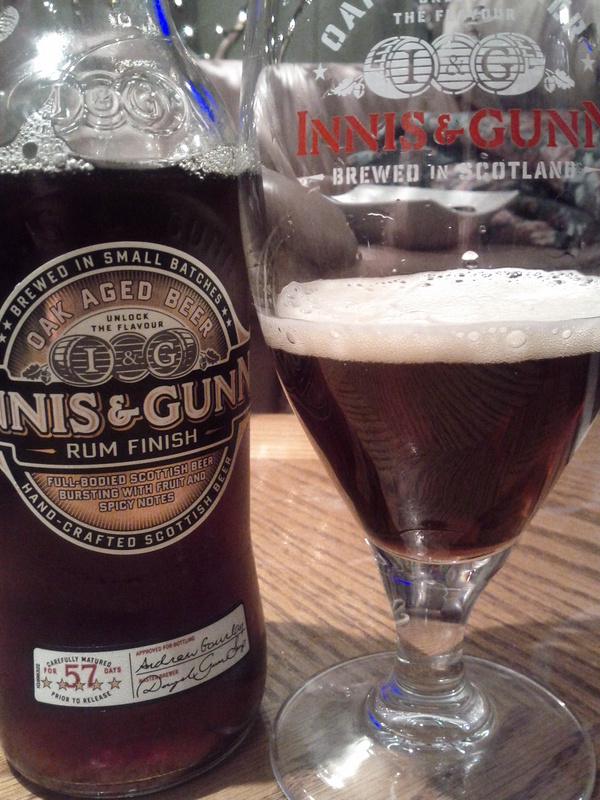 The typical Innis & Gunn sweetness is mostly replaced by flavours of roast, malt, and whisky. Some vanilla certainly remains, though. On both the nose and the palate is mostly the malt, yet the beer retains the lingering smoothness on the palate typical of Innis & Gunn. It is significantly lighter, though creamy and velvetty, than your typical ‘stout’. This results in a nice crisp, inoffensive finish. This might be where my problem with this beer lies: It’s good, no doubt, but, as an oak infused stout, I expected stronger flavours. I expected more whisky, more vanilla, and a more vibrant beer all-around. As demonstrated by this point, if you haven’t noticed, Innis and Gunn is a long running favourite of ours, and this particular brew is no exception. Similarities in nose carry over with vanilla, chocolate and malt sweetness. Has a similar scent that reminds me of Red Truck Brewing’s Madscow or Crannog Ales’ Backhhand of God… both very well done local craft stouts! The body is a rich black tht fully encompasses mouth like North Coast’s Old Rasputin, more velvety than the creamy sensation of a Guinness. There is a slight bitterness to it as well. The taste was malty, chocolate, vanilla-treacle notes, lightly balanced and not as complex as the 21 Year Highland Cask. The Finish is malty tones, slight hops, yet certainly the sweetness and oak are most prevalent. While not my favourite by the brewery, it is a VERY welcome addition and one i hope they continue with for years to come. Probably if i were to drink this again, i would refrain from using it as a session beer as it is delicate in complexity and it boasts a high level of alcohol at 7.4%, therefore a better night cap or dessert beer. With the success of the Rum Cask and refined Rum Finish, Innis & Gunn had produced a limited release of this Spiced Rum Finish, with Caribbean rum meeting Scottish ale for likely the first time ever in a beer. What results is a complex mixing of spice and sweet in the palate that either entices the drinker or confuses them as to the nature of the beer. Aged 47 days and at 6.9% this beer was a talking point at our tasting so I hope those who’ve had it before jump in to give their opinions too! At the time, this was my least favourite Innis & Gunn beer. I did enjoy it, but it came as a bit of a shock how little I liked it in comparison to the others. While somewhat heavily spiced, the flavours are rather subtle. The beer is not nearly as vibrant, fresh, or punctual as I’d like it to be. There is some nutmeg and caramel, but other than that, the spices are barely noticeable. On top of this, the oak-infused flavours, such as toffee, vanilla, and butterscotch, are all but lost, depleted by the muddled spices. This is what puts me off the most. Furthermore, the lingering spice and malt is not a taste I enjoy sitting on my palate for too long. That said, it’s still Innis & Gunn; it’s still rather smooth and crisp; it’s still better than most beers out there. This beer was my favourite from the Winter pack for 2011. This fact even surprises me to be honest, as I kind of stood alone from the other three at the tasting. Perhaps this beer has a “love it or hate it” quality about it, but personally I found it fresh and an intriguing mix of ingredients that Innis & Gunn brought to the table. The nose was light/mellow spice with vanilla, toffee, and a fruity tone that remained underlying throughout. The body was bitter from citrus hops and a medium level of thickness. Texture was a big part of enjoying this beer for me. The taste was complex compared to other beers from this brewery with biscuit like malt, spices, oak, and rum. The finish was spices and oak, which was smooth and drinkable. I found thisto be very nice since it was drinkable, reasonably complex on the palate without working too hard to determine what was what. Overall a relaxing beer to drink and worth it if you’ve had the Rum Finish. In the winter of 2011 Innis and Gunn released a winter pack with three beers and a collectible glass. The three beers were the Original, the Spiced Rum Finish and the Winter 2011. Needless to say Kamran and I purchased a few of these packs between the two of us. This brew was a rich savoury beer that was made for the winter night and could be sipped on next to the fire, or equally enjoyed with roast pork or rack of lamb for dinner. The Innis & Gunn Winter ale has a strong malt backbone, but enough hops and oak infused flavours to make for a crisp finish. While not as complex or profound as, say, the original or the Highland cask, it is quite delicious in its unique appropriation of the oak. The sweetness of the malt integrates itself quite nicely with subtle flavours of vanilla and oak. While I miss that the toffee and caramel is all but lost on the Winter Ale, I can appreciate what it has to offer. The body is relatively creamier and heavier; unlike the original, I would prefer not to session this beer — it’s even more of a sipper. The palate is deftly complemented with flavours of roast and chestnut, that, while not long-lived, are quite enjoyable, and result in a long, consistent, and crisp finish. Only two beers the night of this tasting, several months ago now, cracked the 90’s in scoring, and both happened to be in the Winter pack. This beer did so well because it seemed to be different than the tried and true approach of the brewery. It was richer and fuller while keeping the familiar sweetness, which was more subdued than usual. With some unique aromas on the nose: Christmas pudding, apple, pear, dried fruit all hidden amongst the tamed malt and oak, this was an intriguing shift. The body for this Scottish ale was thick and well formed, creamy yet not heavy like a stout. The taste was primarily malty with some citrus orange zest, and a more of a rum taste than whisky in my opinion. The finish was vanilla, citrus, oak and it lingered in a nice and enjoyable mellow manner. A sipping beer through and through. Kamran’s finishing thoughts struck the nail on the head so I wont repeat them here. However, I can only hope that next holiday season Innis and Gunn release a beer of similar caliber, and that hopefully I can purchase it sans the gift box as I now have a few too many Innis and Gunn glasses in my cupboards!!!! 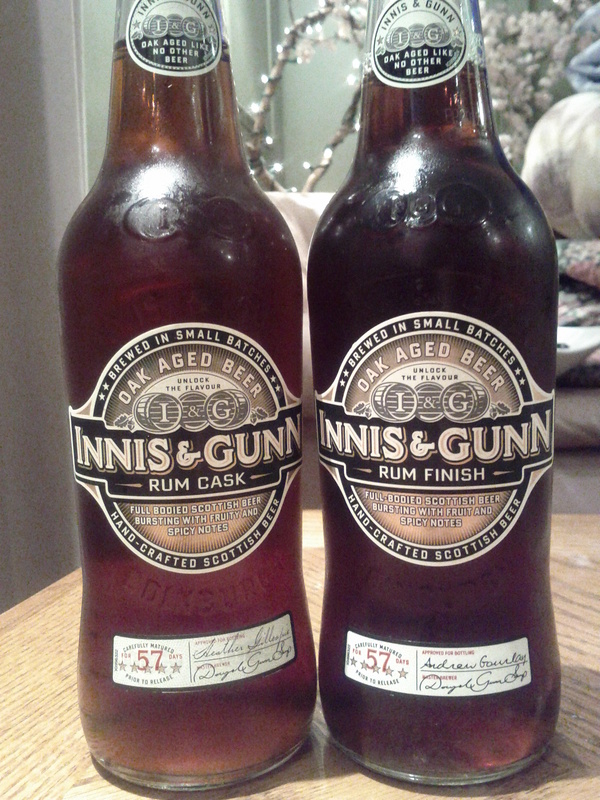 The Rum Finish by Innis & Gunn is more than a re-branding of the Rum Cask, it is a change in the recipe and that’s why we are writing two separate reviews after performing a vertical taste test between the two. Be sure to read up on the Rum Cask article for our comparisons. Innis & Gunn’s replacement to the rum cask, I find, is slightly more enjoyable than its predecessor. I believe it retains more of the original flavours, which might come as a problem to those rum drinking lovers of the cask. Slightly darker and slightly maltier, the spices, though still there, are quite subtle, allowing the flavours of toffee and vanilla, infused from the oak, to come out more. With the malt comes a slight heaviness when compared to the rum cask, but it remains creamy; the full body is quite a delight. On the finish, the spices, particularly caramel, leaves the palate in wanting. It is consistent, fresh, and rather delectable. As Kamran noted, this beer is a darker and more balanced/refined beer than the Rum Cask. Still aged for 57 days and maintaining a strength of 7.4%, this beer seems to better incorporate the different ingredients to make them more cohesive and play on one another in the palate. The aroma is richer with a stronger smell of vanilla, rum, oak and spice. The body is less watery and more like a medium bodied porter – yet certainly not heavy! The taste is more sweet (possibly syrupy sweet is the way to define it best), a more pronounced rum taste than the Rum Cask is evident and very much appreciated. 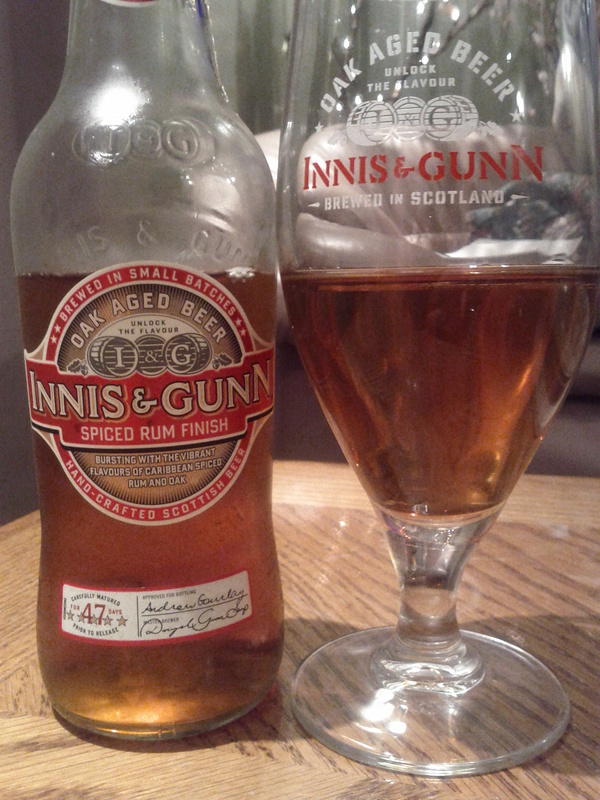 The finish sees the vanilla linger with the toffee, as per usual with Innis & Gunn I find, with very little rum as was delivered in the taste. Similar to the cask version, only this seems to last slightly longer before fading away. While I do like this beer and find it improve over the Rum Cask, the lack of rum in the finish has been a detractor for both beers as the vanilla and toffee are very dominant. That said, this beer is great and I would recommend it to anyone who wants a unique beer that isn’t hoppy or bitter. The Innis & Gunn Highland Cask is a once-a-year seasonal that comes out in the fall. As the name suggests, it’s a beer that has been aged in previously used single malt whisky barrels from the Highland area of Scotland. While they do not release the source of their barrels, and while it probably changes each year, it’s safe to assume they are purchasing from a major distributor, and, therefore, well-known distillery — likely owned by Grants. Highland single malts tend to be light, biscuity, and slightly sweet, particularly on the finish. These flavours and textures are transferred into the Innis & Gunn 18 Year Highland Cask which is aged for 69 days, and boasts a 7.1 alcohol percentage. On multiple occasions I have claimed the Innis & Gunn 18 Year Highland Cask as the best beer in the world. Since then, nothing has changed, and I have yet to meet a product that better epitomizes what a great beer should be. This is my favourite beer — this particular release. I have 4 bottles remaining; they have to last my lifetime! — I doubt they’ll last another year. The original flavours typical of Innis & Gunn are even more pronounced here. Notes of vanilla, caramel, butterscotch, and honey come out in spades both on the nose and the palate. To top this off, there is a mild whisky taste, that comes through on the finish in particular, giving it a crisp, refreshing, long lasting aftertaste. The level of sweetness is quite high, and the beer is incredibly vibrant, unlike the 21 year, which we tasted — for the second time — vertically. The 21 year boasts notes of citrus, and the typical Innis & Gunn flavours are relatively subdued, while the 18 year is a powerhouse of aromas and tastes. There is something highly fresh about the Innis & Gunn 18 Year. It must be the Highland water or something. The beer just tastes exceptionally fresh. There is a touch of whisky on one’s initial taste, that subverts itself into a creamy-velvetty-ness on the palate; the beer is certainly a touch heavier than the original. Besides making it more robust, I believe the whisky, in itself, opens up the flavours of the beer more. As a result, we have the strongest predilection of Innis & Gunn flavours, making it my favourite! 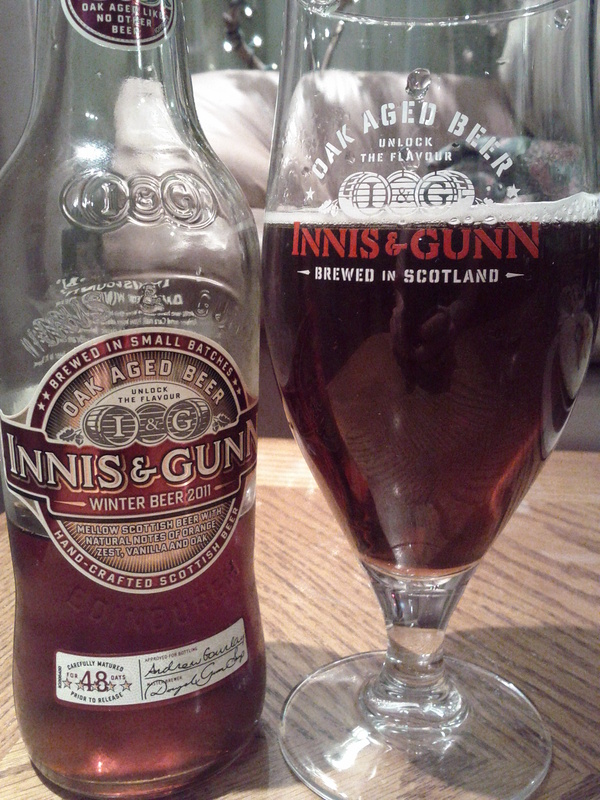 While I scored this beer well, my favourite Innis & Gunn was the predecessor to this beer, the Highland 21 year cask. And while Kamran and I may disagree on which vintage was better, this one surely does not disappoint even if it was my “second best” of the two years. This vintage was sweeter on the nose with more malt, oak, vanilla, and toffee. The body was smooth and even crisp, if not a touch sharp for the first few sips. Compared to the 21 year, the 18 year cask was noticeably darker in colour. The taste was malty with some bitterness. There were notes of caramel and toffee with vanilla. The whisky was clearly more present in the taste of this vintage. While the finish lasted longer by a tad, it was pleasant with the combination of malt, whisky, and vanilla. I think part of the reason Kamran and I have the two competing for top beers is because by the time he tried the 21 year it had already been aged compared to the fresh 2011 cask. Either way, the beer was excellent and I certainly hope that Innis & Gunn continue to make these seasonal releases involving the highland casks. This is a special once-a-year seasonal by Innis & Gunn. It is released about 3 weeks prior to Canada Day, along with an ‘Independence Day” seasonal that’s exclusively seen in the states. Clearly they’re trying to take advantage of the increase in liquor sales around Canada Day/the 4th of July. That’s fine by me, a new Innis & Gunn beer is always special. The 2011 is stored for 54 days in ex-bourbon barrels, utilizes fuggles hops, and rings in at 8.3%. The Canada Day (2011) is complex and unique, and changes significantly over time (Check out the notes made on the 2012 version where we do a vertical tasting). While I had enjoyed this beer last summer upon the release, we didn’t taste this until it was nearly a half-year aged already, so bear this in mind while reading the review. 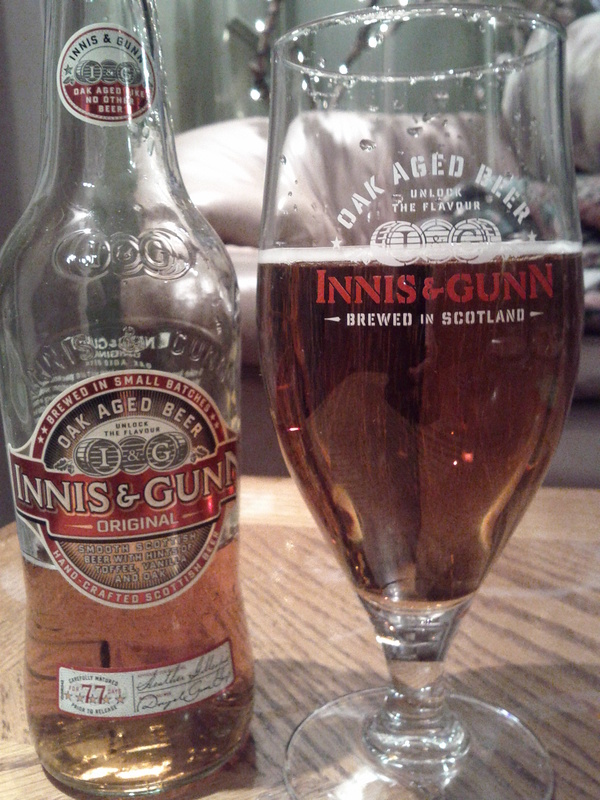 Initially, the Canada Day (2011) Innis & Gunn was quite hop-forward and citrusy. After a half-year, it was still relatively hop forward and citrusy. It is certainly the hoppiest Innis & Gunn beer I’ve had — never got to try the IPA. This level of hoppiness is quite pleasing to my palate, as I enjoy a nice well-hopped beer. Besides the hops are the typical Innis & Gunn flavours, such as toffee and vanilla. They are quite pronounced, but slightly subdued by the citrus-hop finish that dies rather quickly. One may also taste the yeast. I believe this is due to the bottle being aged for a half a year, and, after a year, we will find out that my belief was accurate. The body is creamy and smooth, though slightly lighter than the Original. Canada is supposedly the third largest consumer market for Innis and Gunn -which isn’t exactly too surprising- and they have deemed us worthy of a special release brew! Aged 54 days and sitting at 8.3% alcohol/volume, this beer does feel much bolder than a typical Innis and Gunn. On the nose there is a light hop aroma blended with malty sweetness, while the taste carries the hops, the malt is less pronounced and seemingly less balanced than others; however, it still has the vanilla and toffee notes mixed in there. The apricot coloured body was cloudy/opaque with less carbonation than the original, with a slight bitterness and thicker texture than the others. On the finish, it was oaken with lingering hops on the palate and the standard vanilla/toffee duo. While it was a good beer and a change from the typical malty brews, the Original is still a better bet for cost and overall experience. Oh the Innis & Gunn Rum Cask, a darker amber/brown nectar aged for 57 days in the cask. While it draws on the same techniques for brewing and flavours of the original, this beer is less sweet as the original yet still packs in a vanilla and toffee treat with the malt, and keeps a similar consistency in body. While I’m not sure where the idea came from to use rum instead of whisky, the results are very enjoyable. 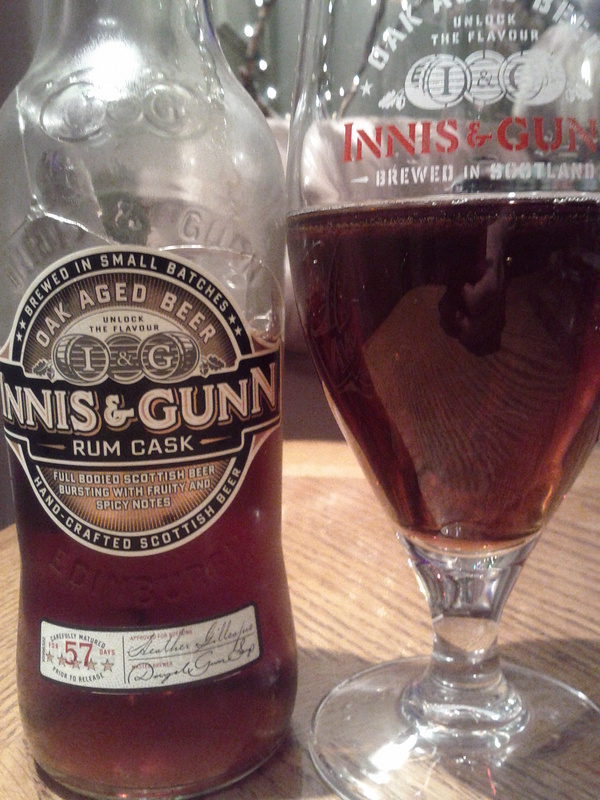 While the rum cask, now rum finish, is a regular Innis & Gunn product, that is available all year long, I don’t drink it nearly as much as the original. Don’t get me wrong, it’s a great beer, just not what I’m looking for when it comes to Innis & Gunn. Aged in previously used rum casks, the beer is infused with Caribbean spices. Though a great fan of rum — likely my second favourite spirit — I’m not a huge fan of spicy beers, or wines for that matter. I like when a beer is spiced lightly with caramel, nutmeg, hops, etc. but if the spiciness is highly noticeable I take offense. That said, Innis & Gunn’s rum cask is not offensive, but it is certainly spiced to a level of slight distaste. 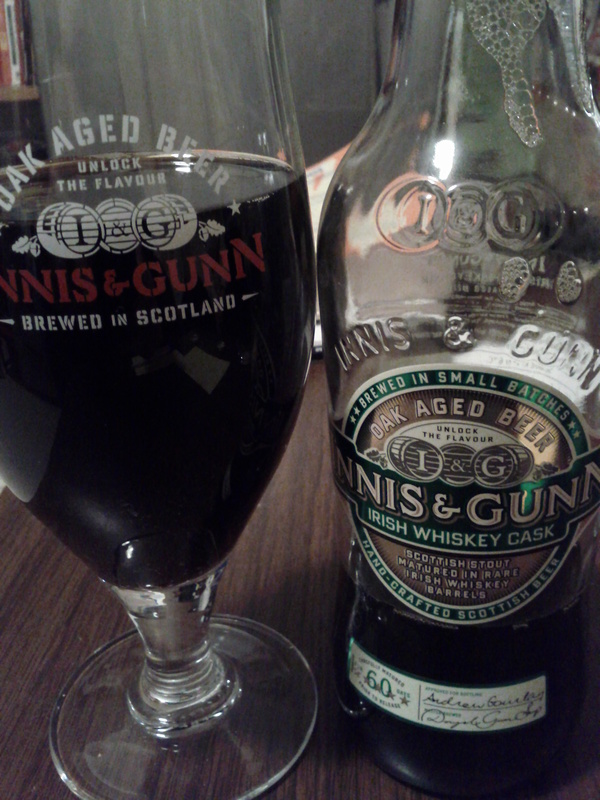 I feel like it takes away from the effervescent oak-instilled flavours that I tend to love of Innis & Gunn. The rum cask, while not my favourite of the series is quite a memorable beer. Like most all Innis & Gunns, it is typically very sweet as opposed to bitter. Aged 57 days and at 7.4% it also is stronger than your average beer. On the nose I detected primarily a spiced scent, combined with a vanilla and mild toffee sweetness, as well as some evidence of a very faint rum and oak. The body is very smooth and velvety, while the taste is very little of the spiced nose elements but more a malty sweetness with the rum. The finish is a slow fade of sweetness that to me resembled a rum and coke fade. While not the top in the collection, this beer certainly was a welcome addition to my fridge and while the Rum Cask has now been changed to a Rum Finish, I would highly recommend it to people who like beers on the malty side of the spectrum. You are all in for a little treat. 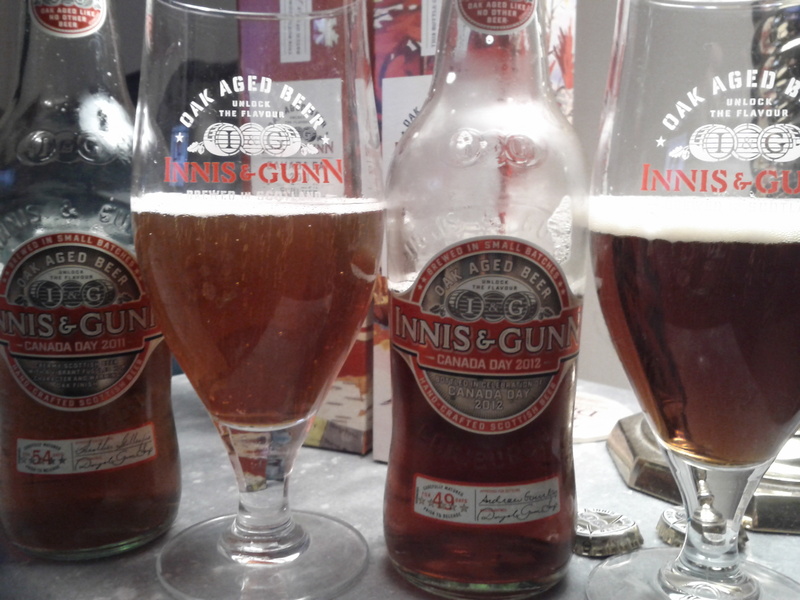 Tristan and I have tasted and reviewed each and every Innis & Gunn product released in the last 1-2 years. Since we’ve already posted on the Highland Cask 21 year (2010), that will be omitted, but you are soon to find reviews on the Original, Rum Cask, Canada Day 2011, Highland Cask 18 Year (2011), Rum Finish, Spiced Rum, Winter Ale, Irish Stout and, finally, the Canada Day 2012 — tasted vertically with a 1 year aged 2011. With the exception of the last two, we tasted the beers one after the other, within a night, referring and relating them to one another. This is how we will review them: with reference to one another. So, if you’re like us, and think Innis & Gunn makes some of the best beer in the world, take a trip through their collection with us! Brewed in Scotland, Innis & Gunn follow a unique avenue in beer craftsmanship: oak-aging! You heard correctly; this is beer that, like most whiskies, rums, and red wines, has sat in an oak barrel, slowly picking up the flavours — vanilla, toffee, caramel, oak, etc. — the wood has to offer. There are few breweries that perform this feat, and Innis & Gunn, the originators, are — put simply — the best. Oak cask maturation not only gives the beer it’s colour, it transforms the flavour compounds in ways unlike anything else. The original Innis & Gunn is stored for 79 days, longer than any of the other Innis & Gunn beers, but they utilize a virginal oak cask. 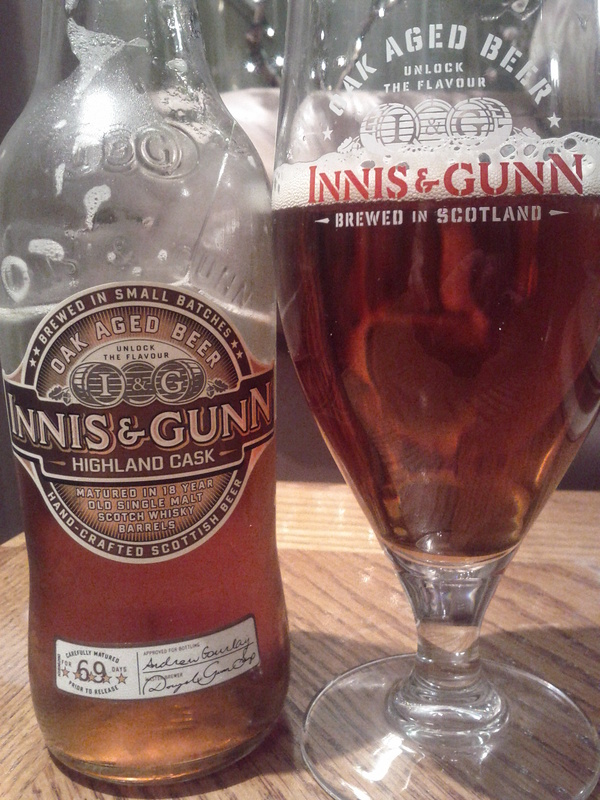 In fact, Innis & Gunn original was first utilized by whisky distillers to imbue whisky casks with some beer flavour. Thank God one of them realized the beer they were throwing out was delicious! You may find the original regularly in both government and private liquor stores. It comes in single 330 or single 750 ml bottles, at a relatively inexpensive price, making it a real ‘go-to’ beer. The Innis & Gunn Original, while not my favourite beer in the world — though pretty damn close — is probably the beer I drink the most. Though I love to expand my horizons and try different beers, I find myself constantly returning to the Innis & Gunn; If I am picking out beer for a night, I almost always grab at least one. It’s a near perfect beer that everyone must try at least once in their life! Smooth, Creamy, Rich, Vanilla, Toffee, Butterscotch: These are the main terms to describe Innis and Gunn beer, particularly the original. It is a true sipping beer that gets better with age and aeration. So, pour it into a glass, let it sit, then slowly enjoy it over time. On the nose, the original is replete with notes of vanilla, toffee, caramel, and oak. On the palate, these flavour are not subdued. They are rather MORE pronounced. It’s truly amazing what this low carbonated beer is capable of. The finish is long and smooth, making you, at once, desire another bottle. Well this is the start of something fun! Yes, indeedy folks, we have done some palate practice and tackled the recent collection of fine beer from Innis & Gunn. While some may not have heard of them before, or seen the bottles in stores but passed over it… you need to try this beer a couple of times to really appreciate it. Luckily it’s not too expensive, and if you’re looking to expand you beer palate this is a good way to start. I moved away from the typical beers when I got my first batch of Innis & Gunn due to sheer curiosity. Now it is still one of my favourite breweries. The original is the first I tried, naturally… …while I wasn’t so used to the taste at age 19, it did grow on me the few times I revisited it a few months later! Aged for 77 days and at 6.6% alcohol/volume, it is not a light beer, but a happy medium. On the nose it has a rich and light sweetness to it, as well as a toffee, vanilla, and oaken aroma. Very appealing in my books. The body was, again, rich and light with a sweetness from the malt, toffee and vanilla. It was also quite smooth leading to a high level of drinkability. The flavour was malty, with light vanilla and toffee under the oak tones. In terms of an aftertaste or finish, the malt lingers on the palate with the taste slowly fading away. Very unobtrusive finish, which leads to the ability to enjoy several in a night should you choose. While not my favourite of the collection, it is a very consistent beer in delivery across the spectrum for which we score. The recent arrival of Innis & Gunn on tap in Vancouver has however reaffirmed my appreciation of this beer as the difference in taste due to freshness is noticeable. As previously stated, try this beer!